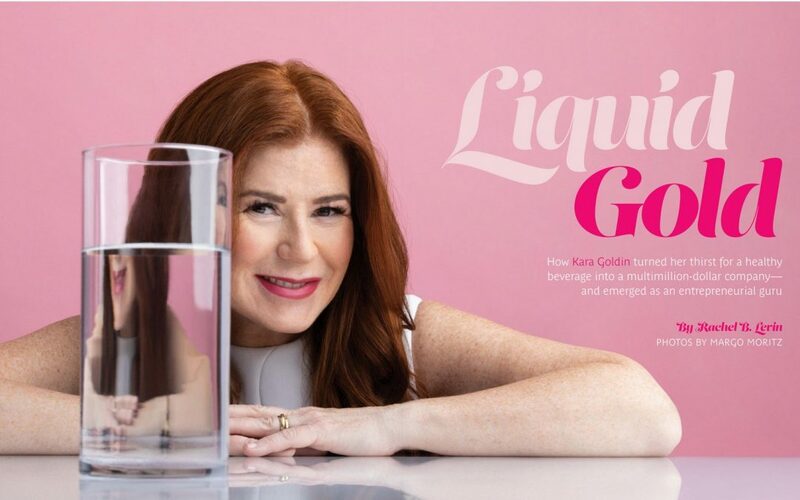 How Kara Goldin turned her thirst for a healthy beverage into a multimillion-dollar company—and emerged as an entrepreneurial guru. It’s an unusually brilliant October day in San Francisco when I arrive to Hint, Inc.’s headquarters on chic Union Street to meet with founder and CEO Kara Goldin. Sunny, clear, and 75 degrees: It’s just the kind of weather that makes Hint’s signature product—water flavored only with natural fruit—really hit the spot. I sip a refreshing peach Hint as I wait for Kara in the outdoor “conference room,” which feels more like a posh backyard than a place of business. There are cushy wicker couches arranged on a carpet of artificial grass, one of Kara’s two Labrador retrievers naps nearby, and a small grove of lush trees filters the dazzling afternoon sunlight. Kara has just spent the morning across the Bay speaking to engineering and business students at the University of California, Berkeley, about entrepreneurship. And given Hint’s astounding growth since she launched the company in 2005—it’s now the largest non-alcoholic beverage company in America that doesn’t have a relationship with behemoths like Coke and Pepsi—as well as Kara’s many accolades (named one of Fortune‘s Most Powerful Women Entrepreneurs and Forbes‘ 40 Women to Watch over 40), it’s not surprising that she’s in demand on both the college and corporate speaking circuits, giving talks two to three times a week. Kara’s advice to aspiring entrepreneurs—or to anyone who tunes into one of her lively social media feeds—is less about the nuts and bolts of business than about the power of staying true to oneself: Find purpose and meaning in what you do, believe in your ideas and ability, and tune out the naysayers you meet along your path. It’s a genuine message that’s true to her own story.